IL PRANZO SOCIALE E’ ALLE PORTE!!! GRANDE ATTESA PER IL PRANZO SOCIALE 2018!!! 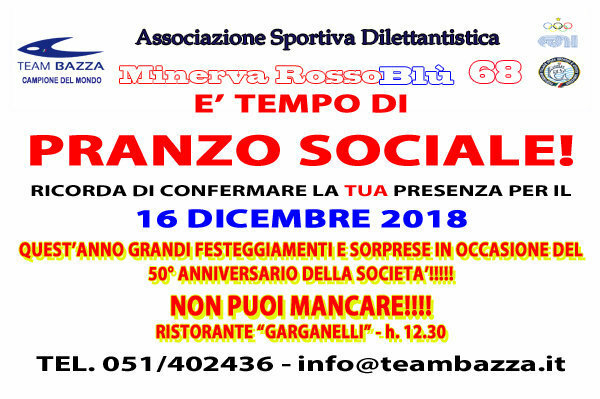 SIAMO IN DIRITTURA D’ARRIVO PER LA SCADENZA DEL 16 DICEMBRE, QUANDO CI SARA’ IL GRANDE RITROVO DI SOCI ED AMICI DELLA MINERVA ROSSOBLU68 TEAM BAZZA c/o IL RISTORANTE “GARGANELLI” DI BOLOGNA PER L’ANNUALE FESTA SOCIALE. L’OCCASIONE DI QUEST’ANNO, POI, E’ PARTICOLARMENTE GHIOTTA PER LA CELEBRAZIONE DEL 50° ANNIVERSARIO DELLA SOCIETA’! « ZAMPATA DEL TEAM BAZZA ALLA COPPA D’INVERNO!